Here's a great way to use up your leftover holiday ham. If you don't have leftover ham, a ham steak should do. 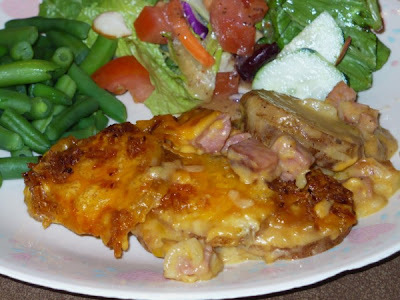 I used a brown sugar ham steak and the sweetness from the sugar added a pleasing dimension to the flavor of this casserole. If you use smoked ham, you may want to use a low-sodium cream soup to minimize the amount of salt. If using a ham steak, I recommend cooking it in a skillet first to draw out the excess water so your casserole doesn't turn out runny. Slice your potatoes 1/8 of an inch thick or thinner to ensure they cook through. Preheat oven to 375 degrees. Lightly grease a 9x13 casserole dish. In a large bowl, combine soup, milk, onion, and black pepper. Stir in potatoes and ham; pour into casserole dish and spread evenly. Cover with foil and bake for 1 hour. Remove casserole and sprinkle with cheese and french fried onions; bake, uncovered, for another 20 minutes. Made this tonight and it was delicious! Thanks for sharing. The only change I made was that I added about 1/2 cup of shredded cheddar cheese to the potato mixture (I just couldn't resist! ).